Kitchen Remodeling: Make Our Designers Your Spring Fling! While the first day of spring won’t arrive for a few more weeks, now is the perfect time to think about how you’ll improve your home as the winter comes to an end. If the thought of investing in a kitchen or bath remodel puts some spring in your step, then reach out to the talented designers from Kiba Studios! We’ll help you create the home of your dreams at a price you can afford. Read on to learn more about how we can help you create a space you’ll never want to leave, and get started with an estimate through this page! There’s something magical about spring. Flowers begin to bloom, the weather begins to warm, and the dark days of winter come to an end. It’s a time of renewal in nature, so why not follow suit and turn over a new leaf in your home? You may be planning to clean out your wardrobe and donate the articles you no longer wear, or you might be thinking about putting some of your clutter into storage. At Kiba Studios, we want to help you make significant home improvements that will last far beyond the spring. 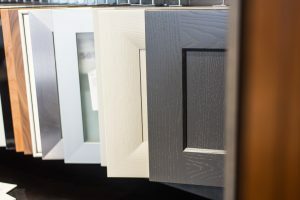 Whether you’re considering a kitchen remodel, a bathroom remodel, or both, you’ll find everything you need to create the home you deserve in our showrooms. Consider adding a few of the following kitchen features to your home! Cabinets: Cabinetry is the star of any kitchen remodel. In addition to completely changing the look of your kitchen, new kitchen cabinets can also improve your workflow without taking up extra space. Below are just two of the many cutting-edge cabinet features we can install! Cabinet charging stations: Your electronics are some of the most important items in your life. From your smartphone to your tablet and electronic kitchen accessories, it’s hard to overstate how much you depend on your devices. We proudly offer kitchen cabinet charging stations that make it easy and convenient to keep your devices at full power! Lazy Susan corner cabinets: Your kitchen almost certainly has at least one 45-degree corner, and it’s notoriously difficult to organize and access the items in this space. At Kiba, we believe that every inch of your kitchen should be functional, and that’s why we offer lazy Susan corner cabinets. Instead of reaching across multiple items and digging through a cluttered mess, you can easily rotate the shelf and find exactly what you need! Backsplash: Backsplashes are one of the best ways to bring functionality and beauty together. In addition to protecting your walls from stains and making your kitchen much easier to clean, a new backsplash will add a personal accent to your kitchen that brings the entire space together. Whether you’re interested in sleek matte tiles or glossy porcelain, we’ll help you find the perfect backsplash for your new kitchen! Countertops: New countertops can take your kitchen from ordinary to extraordinary. Whether you’re looking for luxurious granite countertops or you’re interested in another one of the beautiful options we offer, our kitchen designers will help you choose an option that brings the entire space together. Find a showroom near you to speak with our designers! Floating vanities: While traditional cabinets are constructed from the ground up, floating vanities are anchored to the wall in order to create a captivating illusion. A floating vanity can make your bathroom look larger, show off more of your new flooring, and add even more beauty to your new space! Luxury tubs: There’s nothing quite like a nice bath to help you relax after a busy day of spring cleaning. 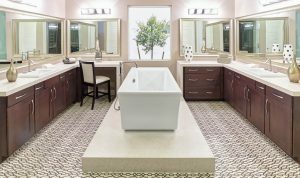 Let our bathroom remodeling experts help you find a luxury tub that you can enjoy for years to come! Cabinets: Whether you need more storage space in your bathroom or you want to open the space up by downsizing, new bathroom cabinets are always a great decision. Come by one of our showrooms to view our unparalleled selection! Bring Your Home Into Full Bloom This Spring! We hope that today’s entry will inspire you to spring into action! Be sure to check our blog regularly, as we’ll continue to provide you with even more information about kitchen and bathroom remodeling in the coming weeks and months. Kiba’s kitchen and bath designers are here to help you bring your dreams to life! You can get started with a free estimate through this page, or you can begin designing the kitchen you’ve always wanted using this page. You can also visit one of our showrooms to speak with a designer about your ideas!